The Outer Banks, a 200-mile-long string of barrier islands sandwiched between North Carolina and the Atlantic, could be famous simply for its broad, Instagrammable beaches, some of which are home to wild Mustangs. But there's quite a bit of history in the area as well — for example, the Wright Brothers chose it as the site of their inaugural flight launches, and the frisky breezes along the shoreline make it easy to see why. At the Wright Brothers' National Memorial in Kill Devil Hills, visitors can walk the original paths of the first flights and see replicas of the brothers' plane and living quarters. Wild Horse Adventure Tours offers Hummer trips to see the area's legendary wild horses and ponies. There's no minimum age limit, but parents of children under age 8 (or weighing less than 80 pounds) must bring their car seats. 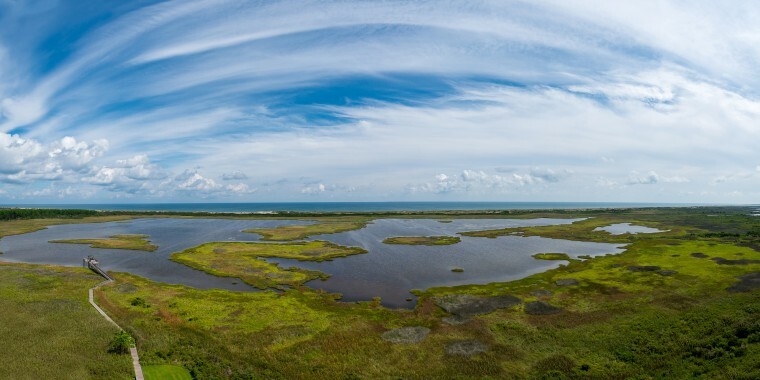 It's possible to ferry from Hatteras Island to Ocracoke Island for a day trip to explore its pristine beaches. Although it's only five miles west, this remote, undeveloped island, most of which is part of the National Seashore, is best explored by bike (there are rental shops near the ferry terminal). The Surfside Hotel in Nags Head is right on the beach and has a mix of accommodation styles in different price ranges. Some have additional lofted sleeping areas to give parents a little more privacy, and the efficiency units have kitchens with stoves and full-size refrigerators. Looking for that easy, breezy resort life? You'll find it at the Sanderling Resort in Duck, where the quiet location makes it feel like you're staying on a private beach. Families typically prefer the North Inn building, which has its own pool. Perks for guests include iPhone docks, comfy Serta mattresses and, down on the beach, helpful valets to set up chairs and umbrellas. Goombay's in Kill Devil Hills has a Caribbean-inspired menu with zesty choices like jerk burgers and coconut shrimp salad. But what kids will remember most are the special drinks created with them in mind, each of which comes with a toy. Crocodile Punch is a blend of three juices (orange, pineapple and cranberry) and the Alien Elixir mixes 7-Up and pink lemonade. It's worth visiting the original Duck Donuts in the Osprey Landing shopping center. You can create your own vanilla-cake doughnut using their list of glazes, toppings and drizzles, or, if you're feeling lazy, just choose one of their popular combinations, like maple icing and chopped bacon, or lemon icing with shredded coconut. When you're finished, stroll the nearby town boardwalk and look for green turtles and pelicans.